PLUMTREE, Zimbabwe, Mar 22 2012 (IPS) - Job Mthombeni loves traditional food. One of his favourite culinary delights is Mopani worms, referred to locally as amacimbi, which means caterpillar in Ndebele. At an early age he understood the nutritional value of the worm, which is found in his rural hometown of Plumtree, in southwestern Zimbabwe. The Mopani worm is the protein-rich caterpillar of the Emperor moth, which can supplement any diet. But as the lack of rain continues to cause havoc with the harvests in this southern African nation, it is now also affecting the supply of Mopani worms. And 49-year-old Mthombeni is a concerned man. “There are no Mopani worms this year,” he complained. Already this year’s low harvest in Plumtree has meant that he has to live off the groceries sent to him by his children working in neighbouring Botswana. “The Mopani worms I have tasted this year are not from my area. We always thought things like the Mopani worms would always be there, but look now…The poor rains have chased away our food,” he told IPS. Zimbabwe has experienced poor rains over the past few years. Though the Zimbabwe Meteorological Services Department had predicted rainfall would peak from October to December 2011, only parts of the country experienced heavy rains, while southwestern Zimbabwe conversely had low rainfall during this time. This past week, rain fell across the country. But it has come long after farmers planted their crop, and much of the maize harvest was destroyed as a result. The situation in Zimbabwe is typical of the region, as countries in the Southern African Development Community (SADC) have been hit with wildly uneven rainfall patterns this rainy season. Madagascar and Mozambique have had a deluge of rain, thanks to Cyclone Giovanna, while countries like Mauritius and Zimbabwe have had low or no rainfall this season. Bradwell Garanganga, from the SADC Climate Services Centre, explained that there is a finite amount of water available, and when it rains heavily in one area, the water is drawn from somewhere else. “The amount of water that is available is virtually constant so, if it rains hard someplace, it means there is somewhere where the rain is not occurring. That, in summary, is what has been occurring in the SADC region in terms of rainfall,” he said. “This particular year has not been too good … If you were to draw a line from Gwanda, in Zimbabwe, to Francistown, in Botswana, all the way back to the southern part of Zimbabwe, that area has been extremely dry,” he said. Mopani worms thrive on fertile conditions and gorge themselves on lush green vegetation. But the disappearance of their environment could mean thousands of villagers in Plumtree, and other areas of the country that have seen poor rains, will be deprived of a vital source of nutrition in the years to come. “It’s not only about the loss of vegetation, and the declining numbers of Mopani worms. It is also about the loss of a major source of protein in the diet of many rural and urban people as well as a loss of income,” said Sobona Mtisi, a climate change researcher with the Overseas Development Institute, which is also leading the Zimbabwean government’s climate change policy formulation with the Climate and Development Knowledge Network. “This has adverse implications for people’s health and income. Are we going to see an increase of diseases linked to a low-protein diet?” Mtisi asked. While the rainy season has always brought with it an abundance of culinary choices for rural communities, it also provides a boost for rural economies. Wendy Zulu is one of the rural women traders who earn their living selling Mopani worms. She makes seasonal trips to the city of Bulawayo, where she sells a variety of wares. But it is the proceeds from her sales of Mopani worms that form a substantial part of her income. “I am yet to make the trip since the rainy season was supposed to begin late last year,” Zulu said. In the past, because of their economic value, when there was an abundance of Mopani worms, farmers and land owners would charge rural women traders like Zulu a fee to harvest them. Now, because of the lack of rainfall, there are hardly any to be seen. “With poor rains, it has meant there is no green vegetation for these creatures. So I just have to wait and see what happens in the coming weeks, even months,” Zulu told IPS. Many miles away in Bulawayo, consumers like Moffat Bancinyane, who over the years have enjoyed Mopani worms as an affordable culinary preference, can only wonder why they have become scarce. “You can never understand why a thing like amacimbi can be out of stock. Come on, these things grow on trees,” Bancinyane said after being told by a vendor outside a municipal beer hall that Mopani worms were not available. “It is true what they say about the rains, that they give life in the most unexpected forms,” Bancinyane said. The scarcity of Mopani worms could just be an indication of a deeper crisis spurred by climate change, Mtisi said. In 2005, the Intergovernmental Panel on Climate Change predicted that climate change would result in increasing aridity in southern Africa, one of the most populous parts of the continent. It also predicted that food production in countries like Zimbabwe would halve by 2020. 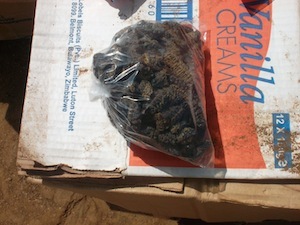 Despite their scarcity, Mopani worms remain big business in other parts of southern African. In Botswana it is a multi-million dollar industry, and South Africa harvests up to 1.6 million kilogrammes of Mopani worms annually. *Additional reporting by Zukiswa Zimela in Johannesburg.